A large green oasis in the middle of town with mature trees, water and grassy areas with the possibility of organizing picnics, walks and relaxation for everyone, regardless of age. It originated in the 13th century as a game reserve. 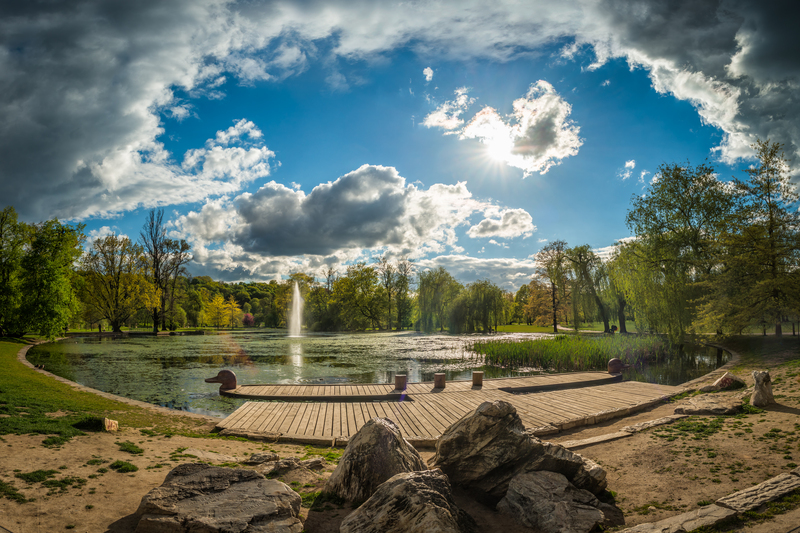 The whole area, a sort of Prague Central Park, is interwoven with many playgrounds and a network of roads and trails that are used for recreation. The Royal Game Park is situated next to Výstaviště Holešovice between the streets Za Eektrárnou and Nad Královskou oborou and a blind arm of the Vltava River called Malá říčka (Small River). Its area changed in various time periods and at present it spreads on the area of 95 ha. The game park was founded during the reign of Ottokar II of Bohemia (Přemysl Otakar II.) who had it enclosed as a game park and built the Summerhouse. During the Hussite period it was damaged, but during the reign of Vladislaus II of Bohemia and Hungary (Vladislav Jagellonský) it was renewed again. Since the Hussite period the game park was made accessible to the public on the saint’s day of St. Gotthard. The measurement of the game park is documented in the year 1536, at that time it was approximately 86 ha (1500 x 1000 footsteps). Ferdinand I of Austria had it extended and connected directly by the direct way to the Prague Castle between 1536 and 1548. A pound was established, the trees brought from Šárka were planted and continuously two parts were created: the eastern game park with the Summerhouse was separated by a wall from the western peasantry and gamekeeper’s lodge, which later became a fruit garden. In the times of Rudolph II, the place enjoyed its main heyday. The Summerhouse at the slope was remodeled in the Renaissance style, the game park was extended and a large – today no existing – pond was expanded to 21 ha and an island in the middle of it was founded. Its most important remnant till today is the Oak Hillock (Dubový pahorek), which is a raised island of the former pond where mighty well-preserved oaks grow. In the years between 1582 and 1593 a unique work was created in order to supply the pound with water from the Vltava River: the Rudolph’s Adit (Rudolfova štola). Although the Great Pound was later filled, the Rudolph’s Adit of the length 1102 m brings water from the Pichl’s house at the Štefánikův Bridge through a tunnel under Letná all the way to Stromovka, where the adit entrance is mounted with a Renaissance portal with the date 1583 and initials of Rudolph II. In the first half of the 18th century, the game park became several times a military camp, which had disastrous consequences. It was so damaged that its winding up was considered. Thanks to Count Kinsky’s care it was finally renewed, thus festivities during the coronation of Francis I (František I.) could be held there. His imperial decree from the year 1804 definitely confirmed its accessibility to the public and since that time the effort to change the game park into a large landscape park in English style has been dated. 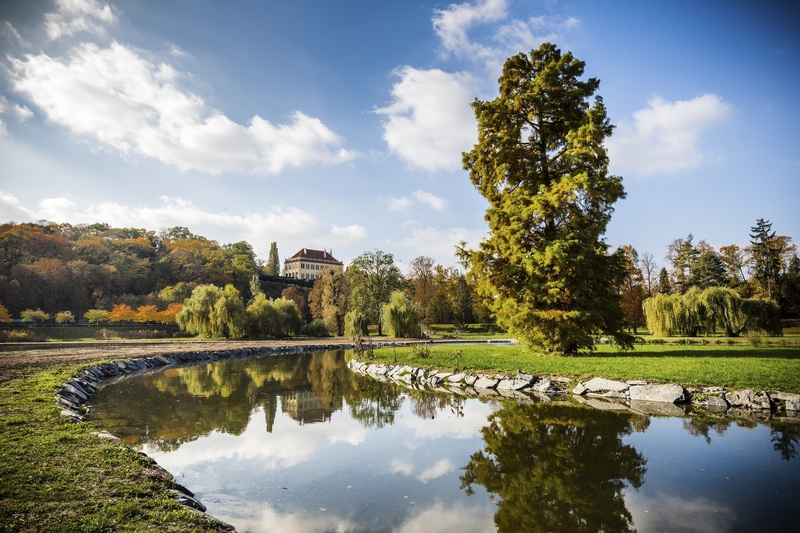 After 1850, a tree garden (Baumgarten in German language) was founded and that is probably the reason why the park is called Stromovka. However, the game breeding was not restored; the parterres were created as well as ornamental flower beds, pools and fountains. In addition, the sculpture decorations were mounted. The wall separating the fruit garden and the game park was removed. Close to the ponds there is so called Old Restaurant alias Šlechta’s Restaurant, originally the Royal Hall, probably designed by Jean Baptiste Mathey, with frescoes by Jan Jakub Steinfels, built in the years between 1689 and 1691, rebuilt by František Antonín Herget in 1791 and rebuilt again into a garden restaurant by Bernard Grueber. Václav Šlechta rented the restaurant in 1882. The building burnt down in 1979 and is still in a desolate condition, though steps to its rescue are being taken. The history of the Summerhouse dates back to the ancient past. As early as in the 13th century there was a little hunting chateu at the place of today’s Summerhouse. The construction (or maybe just a reconstruction) of the Summerhouse in the late Gothic style took place in the years between 1495 and 1502 during the reign of Vladislaus Jagiello (Vladislav II. Jagellonský). Afterwards the Renaissance remodeling was done, started in 1580 and finished in 1594. In 1744, the Summerhouse was burnt down by the Prussian army. 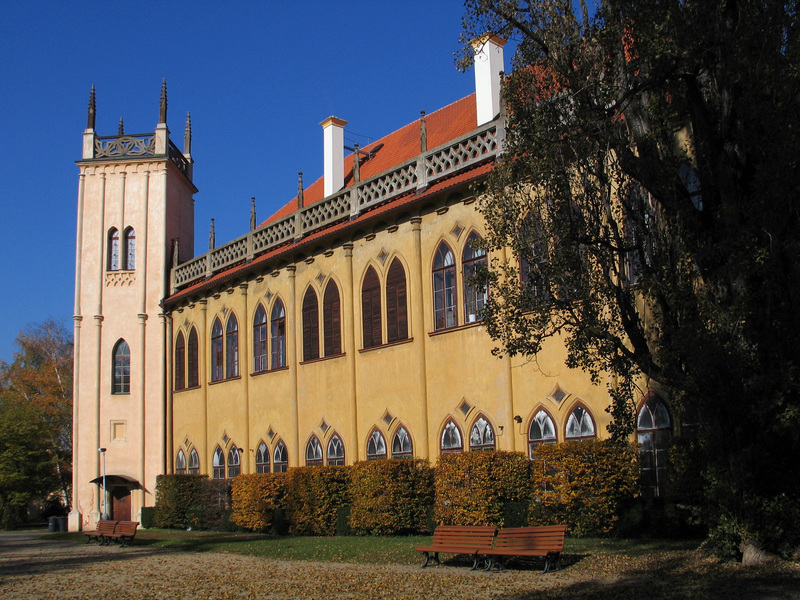 In the 19th century it was rebuilt in the spirit of romanticism-like Neo-Gothic style in the years between 1805 and 1811 by Antonio Palliardi according to a design by Jiří Fischer. At present, there is a department of newspapers and magazines of the National Muzeum (Národní muzeum). After 1880 the garden was remodelled according to a design by Karel Rozínek, the then head gardener of the Royal Game Park. The promenade was created in front of the restaurant, dendrologically significant woody species were concentrated there, a smaller pond was made again, ornamental tree nurseries were enlarged and a geometrically designed Rose Garden was created. Problems with water regime in lower parts of the game park enforced enlargement of the pond surfaces. In 2001, children of Prague gave those pounds these names: Rudolfův (Rudolph’s), Šestáček, Zelený (Green) and Rozínek. 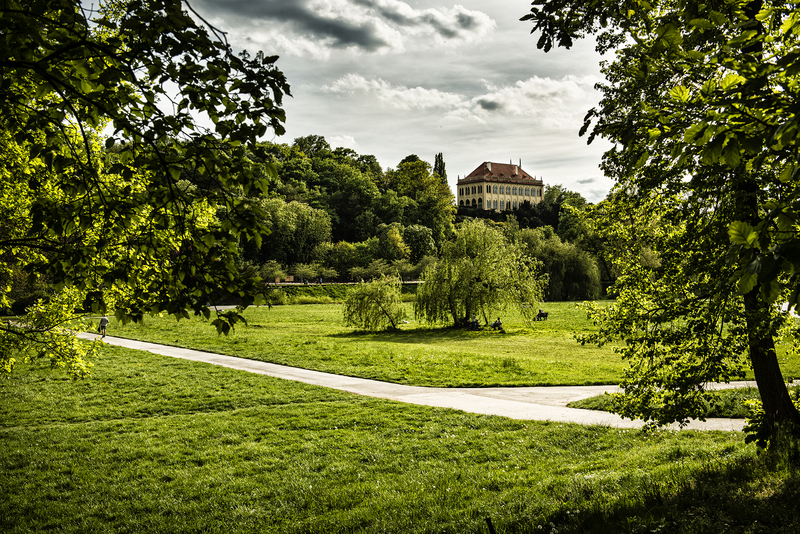 In the 19th and 20th centuries, the garden was quite reduced and devaluated by the construction of Podmokelská (1845) and Buštěhradská (1867) railways, followed by the construction of Academy of Fine Arts (AVU), construction of a ship canal and Planetarium and last but not least by using a part of the park for building the exhibition site for the National Jubilee Exhibition, a present-day Výstaviště (Exhibition Grounds). Stromovka was damaged by floods in August, 2002 when about one-third of the entire enclosure was destroyed. The biggest losses occurred in the of the former Rudolph’s pond. The flood damage a great number of trees, about 200 of them were wrecked immediately, 300 died in consequence of lack of oxygen in the soil and other 200 trees withered. After the floods, Stromovka was made accessible to the public on 1 April 2003.